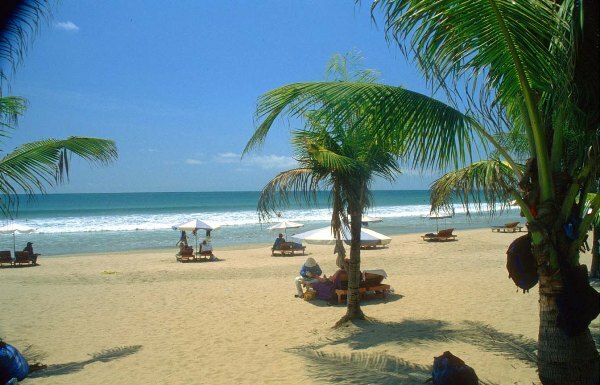 Kuta beach is a tourist place located south of Denpasar, the capital of Bali, Indonesia. Kuta is located in Badung regency. This area is a tourist destination abroad, and has become a mainstay tourist island of Bali since the early 70's. Kuta Beach is often referred to as a beach sunset (sunset beach) as opposed to Sanur beach.In Kuta there are many shops, restaurants and baths and drying herself. Besides the beauty of the beach, Kuta beach also offers various other types of entertainment such as bars and restaurants along the beach to Legian beach. Rosovivo, Ocean Beach Club, Kamasutra, are some of the most crowded clubs along the coast Kuta. 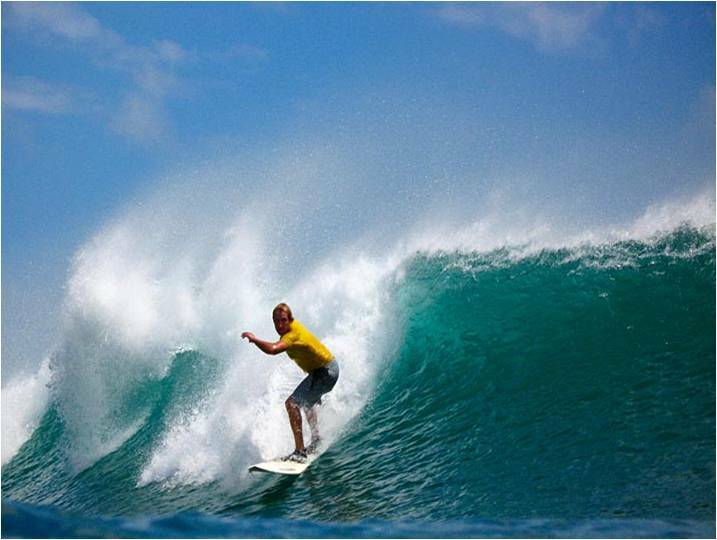 Pantai also has a pretty good waves for surfing (surfing), especially for novice surfers. Field I Gusti Ngurah Rai Airport is located not far from Kuta. Kuta became known when the merchants from Denmark to open trade representative office here. Trade relationship that exists between the representatives of the trade with the native indigenous population and then grow very rapidly. New start in 1930 a married couple from California Americans are very impressed with the beauty of Kuta beach who was completely unspoiled human intervention, the alias is still natural. Kuta Beach Hotel is the first hotel that stands in the region, but unfortunately have to be closed because the Japanese army invaded the island at that time. 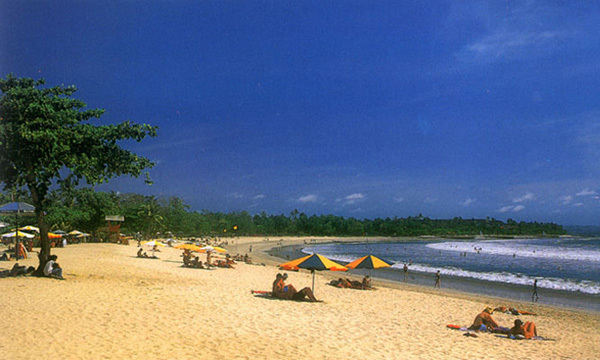 In 1960 when many Australian tourists to stop in Bali for a trip to Europe, Kuta began to gain prominence again. During its development, the more interesting areas of Kuta tourist visits not only from Australia, but also from various parts of the world. Quickly stand up various hotels along the Kuta beach area. Usually hotels are an international region or at least an international hotel group. Starting from the beginning of the end of Kuta Beach Inna Kuta B are each Hotel, Hard Rock Hotel, Mercure Hotel, etc.. Also stands a very comfortable inn-style boutique resort that is Nature Kulkul Boutique and Resort. 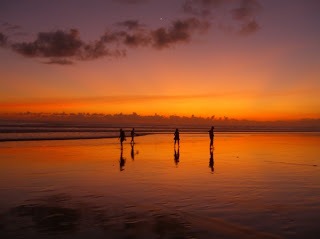 Kawansan busiest time at Kuta beach is in the evening or during sunset (sunset). All of whether foreign or local tourists gathered together here. Moreover, there are special moments in the country such as school holidays, Idul Fitri or Lebaran holiday new year holiday, we can be sure the crowd was getting into. At Kuta beach, visitors can do surfing or surfing, playing soccer, flying kites, just lying on the warm beach sand, or wash the eyes of Western tourists watching the sun. If interested in the services pigtails or temporary tattoo, it can also be obtained at this beach. Kuta Beach can be achieved using private vehicles, taxis, public transport or commonly called Komotra (Cooperative Transport Car Transport). Tourists who will visit the Kuta Beach tourist bus should get off at Central Parking is located approximately 4 kilometers from Kuta Beach. 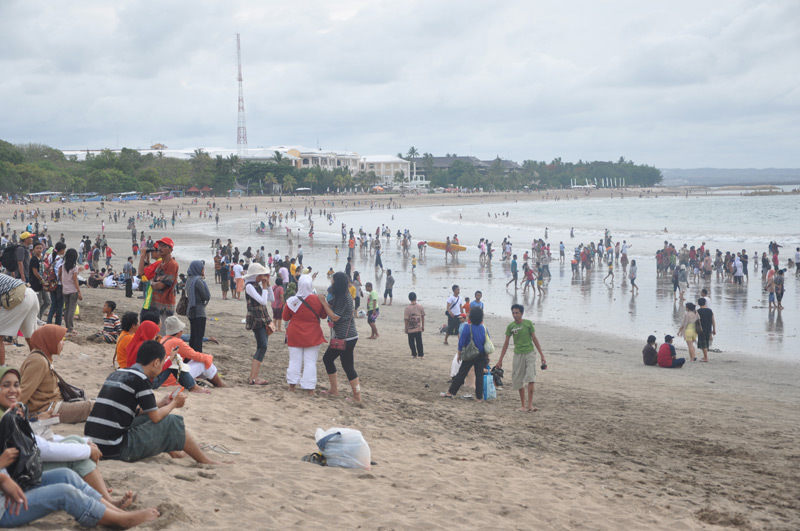 Large vehicles such as tourist buses are not allowed and parking around the Kuta Beach due to traffic streets in Kuta is very crowded, so large vehicles would cause congestion that invites visitors inconvenience. From Central Parking visitors can ride public transportation (Komotra). Right and left side windows without glass Komotra is large enough so that passengers can freely look around the streets where. Komotra can contain 25 people at once in one go. Rates Komotra from Central Parking to the contrary from Kuta Beach or Kuta to Central Parking is $ 3,000 per person. If the current trip-Kuta Beach Central Parking can be reached within 15-20 minutes. Toward the afternoon the road to the beach so the trip can be jammed up to 30 minutes or more.